A repost from last year. If you have cancer in your family, I hope you will take the time to read this. Today, March 22, is Lynch Syndrome Awareness Day. 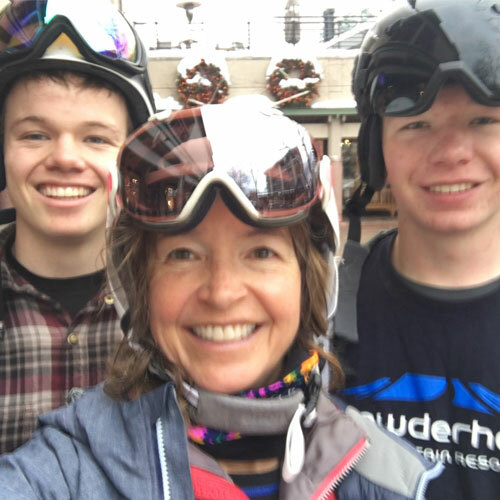 As a cancer survivor and Lynch syndrome carrier, this is my day to divert unapologetically from family skiing and outdoor adventure and don my advocacy hat. Lynch syndrome, also known as Hereditary Nonpolyposis Colon Cancer (HNPCC), is an inherited genetic condition which may affect 1 in 300 people worldwide. My sons and me. We share a passion for skiing. We may also share a genetic predisposition for cancer. Photo: EpicMix, Beaver Creek, CO.
Lynch syndrome refers to a genetic mutation on one of five genes that interferes with the cells’ ability to fix errors in DNA that arise normally and naturally. One of the best analogies I’ve read is to think of each cell as having an automatic spell check system. When a cell presents an error in the DNA, the autocorrect kicks in and fixes the error. In people who carry Lynch syndrome, this process is compromised. As damaged cells multiply, the risk of cancer multiplies. Lynch syndrome, in and of itself, is not a disease, but a strong predictor of future disease. Despite the fact that Lynch syndrome is one of the most common hereditary cancer syndromes, only a small fraction of carriers know that they are at risk. Which is why days like this — Lynch Syndrome Awareness Day — are necessary. An excellent video from Lynch Syndrome Australia that provides 3-2-1 recommendations for genetic testing. 3 people in one family with cancer, at least 2 generations affected and at least 1 cancer occurring before age 50. The only way to confirm Lynch syndrome is with genetic testing or tumor analysis. In May 2015, I went to my doctor with an odd, but not uncommon, symptom. Because she and I knew that my cousin is a Lynch syndrome carrier (although she has not had cancer), there was no messing around and I was diagnosed and treated in less than three weeks. Without this advance knowledge, the diagnosis might have taken much longer and my endometrial cancer could easily have become more advanced. Knowing that Lynch syndrome is in our family, I should have had genetic testing prior to developing cancer. Had I, the recommended treatment would have been preventive surgery. And while that might sound extreme, that would have made me a previvor (someone who knows they are an at risk carrier), instead of a survivor (someone who has had cancer). While the phonetic difference between these two words – a mere prefix – may look small, the difference in physical and mental health is enormous. Shedding light on disease and the causes of disease can save lives. This inspirational photo is from Sunlight Mountain Resort in Colorado. Should You Pay Attention to Lynch Syndrome? Here are some factors that suggest that a Lynch syndrome mutation may exist in a family. If you suspect a pattern of disease in your family, contact your doctor and consult a genetic counselor. Genetic counselors analyze familial patterns of disease and help direct periodic screenings and care. They stay on top of the latest findings and research related to genetic conditions, which means my family and I sleep easier, knowing that someone has our backs. As for popular genetic “testing” services like 23 and Me, these are not recommended. If you suspect your family may carry a genetic mutation, please visit the Genetic Support Foundation to find a genetic counselor. Spell check. A good analogy from an (obviously) good writer. I’ve shared your post on Twitter, LinkedIn and FB. Keep up the good. Thank you so much Jules! I always appreciate your support!